Today I'm excited to announce our first guest blogger, film gabber extraordinaire Lance Werth, from the blogging duo Werth & Wise. Tea often makes its way into the film spotlight and Lance has interesting 'tea' films to recommend. I gave him two different Earl Grey teas to try. Here are his thoughts on the teas, and tea related films. Take it away, Lance! I’m an old movie nut. Just ask anyone. Whether it’s lecturing someone on the inaccuracies of Mommie Dearest (1981), scouring the film schedules of the Brooklyn Academy of Music and New York’s Film Forum for obscure flicks, or posting opinions and wise-alleck remarks in my weekly film blog with Alan Wise, Film Gab with Werth and Wise (http://filmgabwithwerthandwise.blogspot.com/), I’m all about old movies. 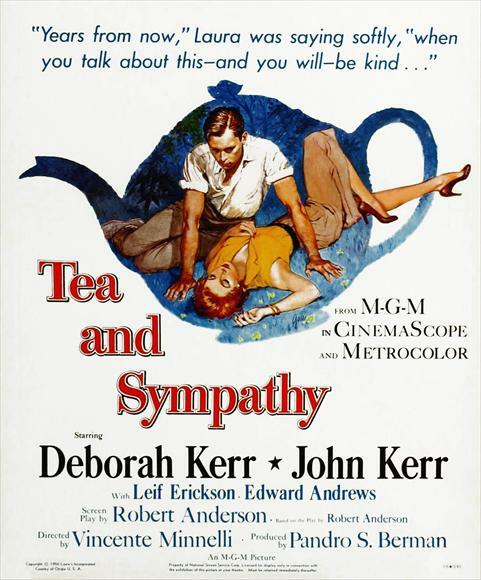 But there are a couple things that tickle my fancy as much as an old movie, and one of those things is tea. I've been drinking tea since I was a toddler. My Midwestern family wasn't quite sure what to do when I asked for a teacup instead of a coffee mug. It started because I originally fantasized that I was British, but my love of tea stuck with me past my move to NYC where I discovered the joys of putting milk in tea from a pushy guy in a breakfast cart. Sara the tea goddess recently introduced me to a couple new teas that made me throw aside the Lipton Earl Grey teabag so I could refine my palette. (http://www.verdigristea.com/flavoredblackteas.html) is a fascinating blend of the traditional Earl Grey flavor combined with jasmine. The resulting concoction feels lighter than many dark teas and is a perky way to start your morning without the harsh kick that milk-less Earl Grey can sometimes give. French Early Grey (http://www.theteamerchant.net/our-teas/black-teas/french-earl-grey/) can best be summed-up as two great tastes that don’t taste great together. While the vanilla flavor in this blend is much less cloying than I’d thought it would be, the pairing of the Earl Grey taste and vanilla rubs my tongue the wrong way. 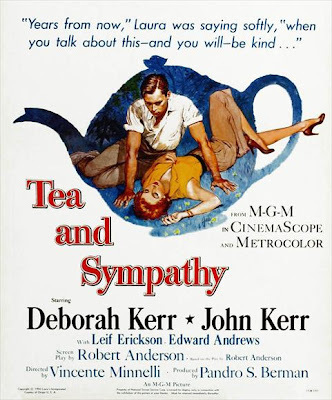 Tea and Sympathy (1956)- Young Tom Robinson Lee (John Kerr) is tortured for being the school sissy, so his teacher’s wife Laura Reynolds (Deborah Kerr- no they’re not related) decides to make a man out of him in this controversial, Vincente Minnelli-helmed drama. The Bitter Tea of General Yen (1933)- Barbara Stanwyck is a Shanghai surprise in this Pre-Code film about a missionary’s fiancé who is kidnapped by the evil General Yen, who, you guessed it, gets a yen for the spunky blond. Directed by legendary director Frank Capra. Tea with Mussolini (1999)- What do you get when you have a tea party with film dames Judi Dench, Joan Plowright, Maggie Smith and American actresses Lily Tomlin and Cher in pre-WWII Fascist Italy? A tear-jerker somewhat based on the early life of famed film director Franco Zeffirelli. Alice in Wonderland (1951)- No kid (nor adult) who sees Disney’s animated classic loosely adapted from the Lewis Carroll book could ever forget the inspired lunacy of the Mad Hatter’s tea party. It makes you want to take a bite out of your tea saucer. The African Queen (also from 1951)- The great Kate Hepburn and Humphrey Bogart sail a junky boat downriver to break a German blockade in WWI in this John Huston classic. While Bogey drinks booze from a bottle, Kate makes her tea with the steam from the rusty boiler. More sugar please. The Nanny (1965)- No Fran Drescher did not star in this English horror film from 1965. But Bette Davis did- and believe me, you don’t want to drink her tea. A huge thank you to Lance for his thoughts. Check out his blog for more film gab! Interested in writing a guest post for Tea Happiness? You don't need any experience with tea, just an interest to try it. Drop me a line and let's discuss.